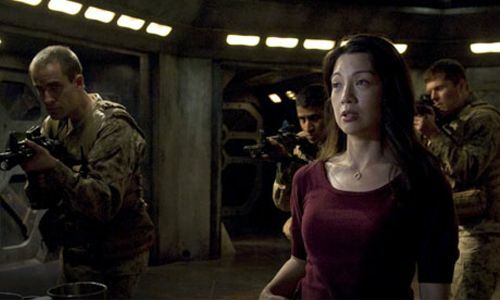 Cultural Wormhole: Stargate Universe - "Deliverance"
Camile (Ming-Na) pays Chloe a visit. After a three month hiatus, 'Stargate Universe' is back. Unfortunately, during the break Syfy announced that they were cancelling program, which has been part of a long running science fiction franchise that had benefited the network for the better part of a the last decade. Luckily, 'SGU' isn't getting its remaining episodes burned off in a single day like 'Caprica'. I guess Syfy feels they can still make a little money off the show. It's sad to say, but once 'SGU' rides off into the sunset, I will probably have no desire to watch anything on Syfy. While 'SGU' and 'Caprica' have had their respective flaws, there was a definite attempt to deliver a more mature style of sci-fi that is not present on the rest of the network's programming. Unfortunately, Syfy has more in common with SpikeTV these days then say, FX, which has become the home of some really solid, albeit low-ratings netting, basic cable dramas. These long mid-season breaks have never done the shows on Syfy and favors, especially if a cliffhanger is involved. Even after the recap, it took me a few minutes to remember what the hell was going on during the last episode. Part of the problem was that there were just too many factions to keep track of after not watching the show for a quarter of a year. We have the crew of the Destiny, Telford's little pals called the Ursini, Chloe's alien from the other galaxy, and robotic drones. I'm almost thankful that the Lucian Alliance folks got lost in the shuffle as a result. Eli and Rush adapting the swarm seemed like a foregone conclusion. It's debatable if the solution was too heavily telegraphed or the result of well-laid breadcrumbs. Regardless, it wasn't a big surprise. Still, it provided for some fun space explosions. The writers handled Chloe's predicament smartly. This has been a character that didn't have much to do until she became infected with alien DNA and was becoming a sleeper agent. That plot thread had ran its course and the "what do we do with Chloe?" debate could only go on for so long. Now that she is supposedly clean of the alien influence and growths, Chloe has been able to retain the knowledge she gained while exposed. This will give the character more opportunities to interact with the crew during vital missions and give her stuff to do other than wear tight tank tops and pine for Matt. Rush is starting to care about people on Destiny. Maybe it's the recent loss of Amanda or the prolonged exposure to the people around him. There's also the acceptance of Destiny's true mission, too. Still, Rush has grown to care about Chloe in particular. If we had another season, it would have been nice to see these two develop a surrogate father/daughter relationship. The real challenge for 'SGU' will be to see how much the creators will be able to wrap up before the finale. The ship is still speeding to its destination, plus there is the impending invasion of Earth by the Lucian Alliance. They've got nine remaining episodes; here's hoping they make them count.